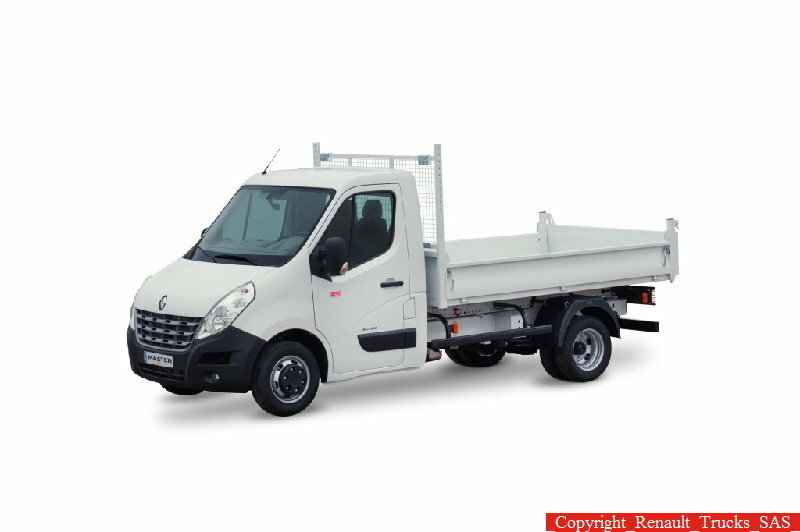 The Renault Master Chassis- and Platform-Cab models have a very versatile character perfectly suited for the light commercial vehicle segment. With two types of cabins (Single and Double), four different vehicle lengths and the choice of front- or rear-wheel drive, the Master was designed for delivery services, construction, controlled temperature transport or the transport of equipment. Its biggest advantages are the competitive prices and the low maintenance costs which make it a cost efficient partner for your daily transportations. Moreover the vehicle can also transport a generous payload of up to 2.5 tones and is available with both Euro 4 and Euro 5 engines. The Master Service intervals are scheduled at every 40,000 km while the full warranty is available for up to three years or 100,000 miles. Unlike other trucks in the segment, the Master received more attention from the design team which managed to combine the practical nature of the vehicle with a pretty modern look. The Renault Master’s exterior features a lot of clean lines which gives it a solid stance. We especially like the new front grille which enhances the rugged nature of the vehicle, while the huge elongated headlamps give a sense of dynamism to the entire truck. The black plastic bumper also gels well with the hood lines and features a nice flowing pattern. The rough character of the Master is also enhanced by the flared wheel arches, but the 16 inch wheels are bit too small and don’t cope well with the rest of the body. Thanks to a modular structure, a removable rear cross member and body lengths between 2.43 - 5.74 m the Master’s chassis can be fitted with various equipments being very versatile. Step inside and you’ll find plenty of space even in the Single cab model. The dashboard is a bit cluttered and could’ve come with a better ergonomy, while the materials are also rock hard and pretty cheap. The round air vents don’t cope to good with the dashboard design either, and look out of place. Luckily, the three spoke steering wheel looks fairly good and offers a good grip. We also like the gear level which is mounted into the dash and not on the floor like other vehicles in this segment. The dashboard features a few useful storage compartments which are within easy reach from the driver’s seats. There is also space for A5 size documents, a built-in swing tray in the instrument panel and a host of useful compartments in the doors and overhead. The air suspended adjustable seat offers pretty good support and its comfort is enhanced by the ergonomically designed armrests which are a rare in this segment. 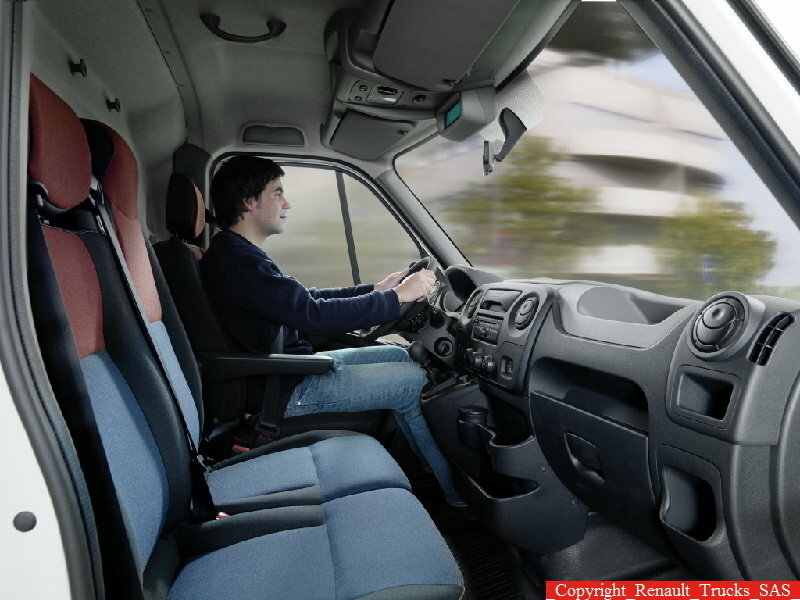 The driving position is high and offers a good all round road visibility, while the steering can be also adjusted, so it won’t be hard to find a comfortable position. The front seats offer space for three passengers and even if the middle one could feel a bit cramped the seats are a bit more comfortable that what you’ll find at Isuzu’s models. The double cab features plenty of room for three passengers at the back and there is also enough legroom for all of them. The Renault Master can also be kitted pretty nicely with a few goodies which will make your life easier such as the TomTom GPS, Bluetooth for mobile phones, air conditioning or climate control that can also be set to cool the glove box and radio/CD/tuner with steering-mounted controls. The Renault Master is available in three engine flavors with maximum power ratings of 100, 125 and 150 hp with maximum torque achieved from as low as 1,250 rpm. Thanks to the low fuel consumption rated at only 35.5 mpg, the Renault Master is among the most fuel efficient vehicles in the segment. The engines are strong enough to deal pretty good with their 3.5 tonnes payloads and even if they aren’t the smoothest in the segment you won’t find their noise disturbing. 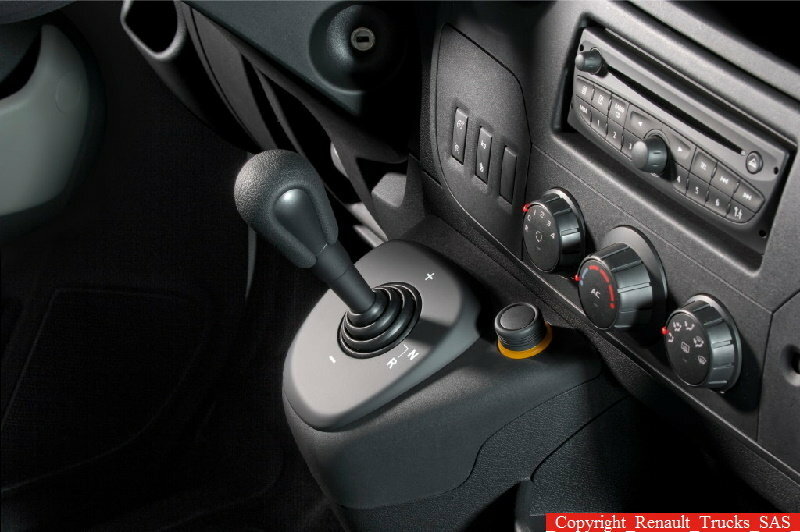 The engines are mated on a 6 speed automated gearbox which features smooth shifts and offers a good fuel economy. Unlike the front wheel drive model, the rear wheel drive Master features low gearing which gives it better grip for the steep inclines and the muddy construction sites. For specific bodies, the Renault Master can be also equipped with an engine power take-off and a transmission power take-off. 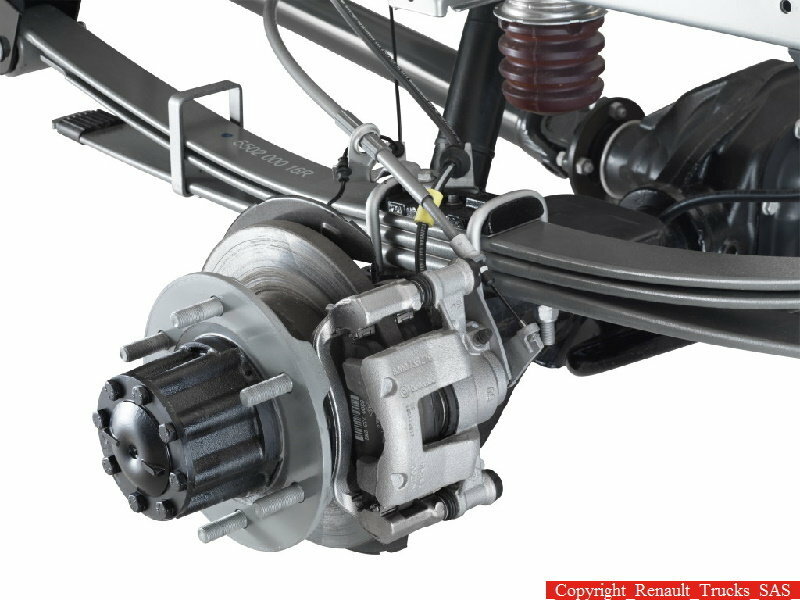 The Renault Master was designed to carry big loads and for this mission it needed reliable suspensions. As a result, Renault fitted its light commercial vehicle with a rigid steel axle at the front and parabolic suspension at the rear with telescopic shock absorbers all-round which soaks most of the bumps pretty well. To enhance the ride quality the truck is also fitted with anti-roll bars which improve the overall handling and minimize the impact of heavy cargos. The power assisted is pretty light, but it doesn’t offer a great feedback. However, the small 6 m turning radius gives the vehicle a good drivability around the city. 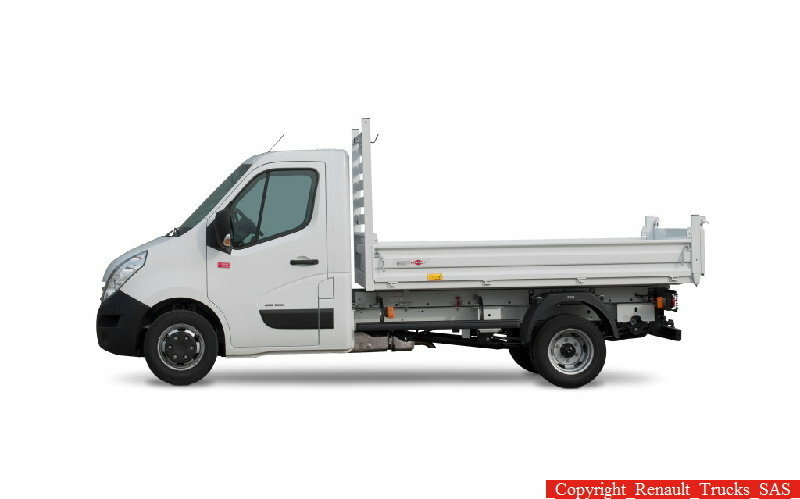 The Renault Master Chassis and Platform Cab models offer a good balance between price, maintenance costs and performances. The truck can handle a generous amount of payload and even if it’s not fitted with the best engines form the market, the diesel units are able to make their job with dignity. The overall build quality looks also pretty solid and the cabin offers plenty of space, good all round visibility and a good driving position.